Buy tickets online or call 800.448.3883. 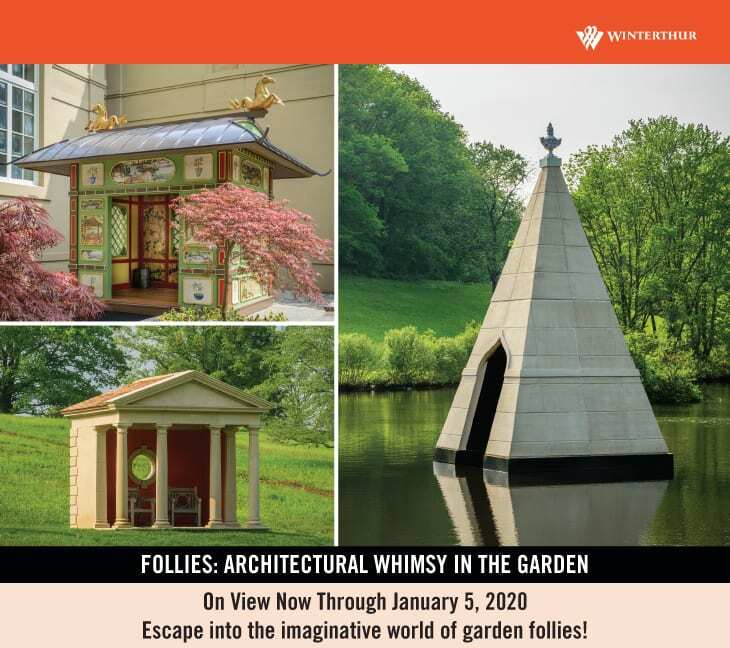 Escape into the imaginative world of garden follies, Winterthur’s first-ever exhibition of whimsical and classic garden structures. Thirteen fantastic structures await discovery and exploration—from a Gothic-inspired tower, an Ottoman tent, and neoclassical follies to a Chinese pavilion, American summerhouses, an enchanting faerie cottage, and creative contemporary follies—all set within Henry Francis du Pont’s majestic garden. Whether by foot or tram, plan for outdoor adventure with a twist of fun! Follies are architectural constructions, often extravagant or picturesque, positioned within the landscape to amuse, frame a view, or pique your curiosity. You may have seen follies at other estates or in television shows or movies, such as Downton Abbey or Brideshead Revisited. Henry Francis du Pont, who developed Winterthur’s expansive gardens from 1902 to 1969, was familiar with follies throughout America and Europe and incorporated several into his own garden plans. Needle’s Eye—Inspired by a folly constructed in the 18th century in Yorkshire, England, the Needle’s Eye floats on a pond adjacent to Winterthur’s main drive, creating reflections in the water and capturing visitors’ interest as they enter the estate. Neoclassical Folly—Modeled after the portico, or entrance, to a Greek temple or public building, this is and is a common design in garden architecture. The formality of the structure contrasts sharply with Winterthur’s meadow surrounding it. 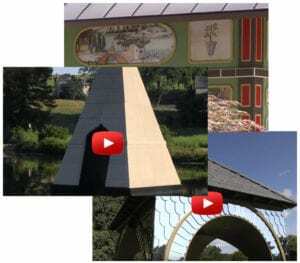 Click to view the Folly videos. Mirrored Folly—This mirror-clad building reflects the surrounding Pinetum and is inspired by the porte cochère (covered entrance) of Winterthur’s historic train station. Ottoman Tent—An interpretation of a Turkish tent, reflecting the fashion for tents and other decorative arts inspired by the Ottoman Empire, this folly is similar to examples of 18th-century exotic tents can be seen in England, France, and Northern Europe, preserved in museums and gardens. Gothic Tower—A Gothic-inspired folly that is similar to the towers, sham castles, and fake ruins, these were very popular in European landscapes in the 1700s and 1800s. These towers would be highly visible and would give a sense of age and importance to the property. Chinese Pavilion—This structure is inspired by the Chinese House at Stowe Landscape Garden in Buckinghamshire, England. Stowe’s Chinese House is an example of the 18th-century fascination with Chinese objects and ornament. The illustrations on the exterior of Winterthur’s Chinese Pavilion are selections taken from the wallpaper in the Chinese Parlor, which visitors can see on a tour of the house. Green Folly—Constructed using Winterthur tree trunks, beech twig thatching, and other woodland embellishments, this folly features plant materials from the Winterthur estate and was designed to reflect the spirit of the garden. Latimeria Summerhouse—Set in Winterthur’s Peony Garden, this pagoda-topped gazebo was saved from destruction by Henry Francis du Pont from the Latimeria estate in Wilmington and installed in the garden in 1929. Umbrella Seat and Pagoda Gate—Also from Latimeria, these charming objects greet visitors as they enter the garden from the path from the Visitor Center. 1750 House—Henry Francis du Pont relocated the façade of a historic house from New Castle, Delaware, to Winterthur in the 1960s. The structure presides over the Conservatory lawn and borders Azalea Woods. Brick Lookout—This little building is an example of how Henry Francis du Pont repurposed architectural elements. It once served as a shed at the entrance court for the museum in the 1940s and 1950s. When a new brick folly was built in the 1960s and placed on Sycamore Hill, the shed’s tin roof and cast iron eagle were moved to cap the structure. Bristol Summerhouse—Located atop Sycamore Hill and presenting sweeping vistas of the property, this summerhouse was re-created by Henry Francis du Pont in the 1960s based on a structure he had seen at The Lindens in Bristol, Rhode Island. Faerie Cottage—This folly is constructed with repurposed items from the estate, including iron and stone elements from earlier gardens. The Faerie Cottage is located in Enchanted Woods, a unique children’s garden created for children of all ages to enjoy and explore. Get your Follies! Details at 800.448.3883 or purchase tickets online. Special group rates available. Please call 800.448.3883, e-mail tourinfo@winterthur.org, or visit the Group Tour Follies web page for tickets. The exhibition can be enjoyed on foot or from the garden tram. The walking loop takes approximately 45 minutes at a leisurely pace. The main path through the garden is wheelchair and stroller accessible. Bring your family and friends or tour group! Special group rates are available.